Fierce Festival | STOP and Play!!! Ping in Brum!! STOP and Play!!! Ping in Brum!! Will you be in Birmingham this summer? …and make sure you go! Ping! England will be hitting Birmingham with bats and balls between 8th July and 8th August! Fancy challenging a handson stranger to a game of ping pong? beating your boss at a game? You have 4 weeks and 55 ping pong tables to make this happen! Ping pong tables will pop up all over the city, from Moor Street Station to The Arcadian, and from Chamberlain Square to under the Spagetti Junction. Having launched last summer in London, Ping! returns for round 2! Acompanied by The Ping Pong Parlour, a shop and ping-pong social club, presented in association with Fierce! The shop will be open from Wednesday to Saturday from 12pm to 8pm, hosting a variety of unusal events from tournaments eg, ‘Brain vs Brawn’, to ping pong bingo, film screening s and ping pong parties. Not forgetting to mention the new addition, The Travelling Ping Pong Parlour, which will travel from London to Birmingham and Hull, to launch the events in each city. 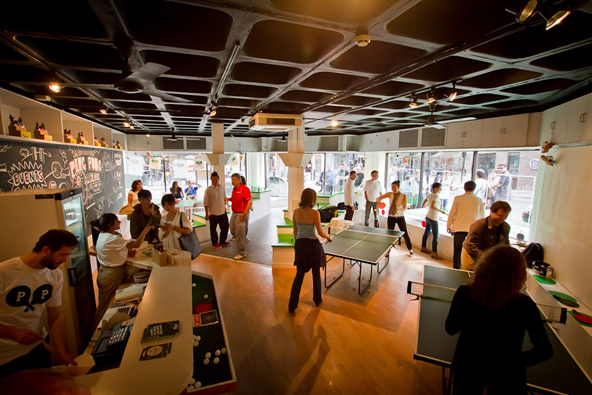 The Travelling Ping Pong Parlour is a one-stop, pop-up table tennis social club that comes complete with table tennis tables, bats of different shapes and sizes, seating for onlookers to watch spectacular matches from – and has a window from which to issue refreshments to thirsty players. 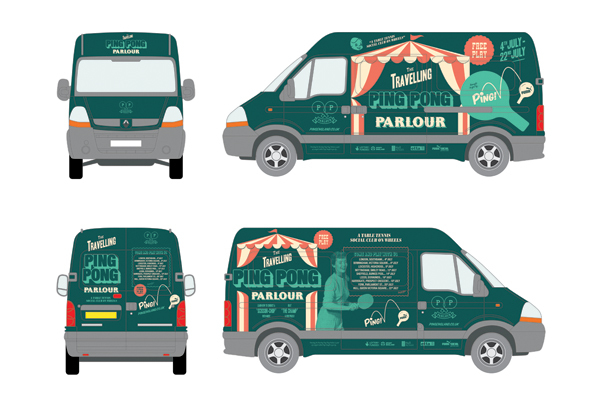 The Travelling Ping Pong Parlour will drive from London to launch this years Ping! Brum on Friday 8th July! There will be games, bats of different shapes and sizes, prizes to be won and a spectacular match played by Team GB. The Coull Quartet will also for the first time, play a unique piece which combines table tennis and a string quartet, composed by Joe Cutler for the Cultural Olympiad. Designed by participatory arts organisation Sing London in partnership with ETTA (English Table Tennis Association), Ping! is sponsored by Puma throughout 2011, a company who love ping-pong. To celebrate the partnership Puma will launch a Special Edition, Ping! branded table tennis shoe called the TT Super. Ping! is supported by National Lottery investment from Sport England, as part of its work to deliver a mass participation legacy from the London 2012 Olympic and Paralympic Games. 2012 will see Ping! Hosted in London once again, as well as two further cities, just in time for the Olympics. Previous: DIY8: 2011 – Call for Participants! Deadline tomorrow!!! Next: British Council Edinburgh Showcase website is live. . .